My piece of the Bayeux Tapestry shows an encounter between two separate groups. With all the weapons, commotion, two distinct sides, and confrontation, it is clearly a battle scene. There are horses falling over, and some are even toppling head over heels with their hind hoofs in the air. Their riders are also falling off. Men and horses lay dead and dying on the bottom of the tapestry with weapons strewn about (Wilson, pl. 66). The two sides are distinctly different; their clothing sets them apart. One side has saddled horses, armor, boots, and helmets while the other side, the enemy, is simply wearing normal clothes, with “kite-shaped shields” as their only piece of armor (Wilson 192). The unarmored group is distinguishable by their facial hair. “Many of them have prominent moustaches and one (pl. 67) has a beard” (Wilson 193). The complete Latin phrase that comes from my plate and a couple previous sections reads: “Hic ceciderunt simul Angli et Franci in prelio” (Wilson 173). This is translated as meaning “Here at the same time English and French fell in battle” (Wilson 173). The text on the tapestry helps us understand who is fighting with each other. The armored men on horseback are the French and the mustached men are the Englishh. Weapons include long spears on both sides, swords for the French, and an axe is seen on the English side. “The tumbling horses represents the so-called Malfosse episode, following William of Malemesbury who may well have been basing his narrative on the Tapestry” (Wilson 192). This seems as though the story is just a story. However, Rud informs us that it was real and that the English wanted to pursue their enemy, disobeying the order of the King. “They were driven up on to a hillock where they were soon overpowered” (Rud 84). Being at the bottom of the hill, not having a real plan, and going against their leader all contributed to the failure of the French army’s attack. Rud, Mogens. 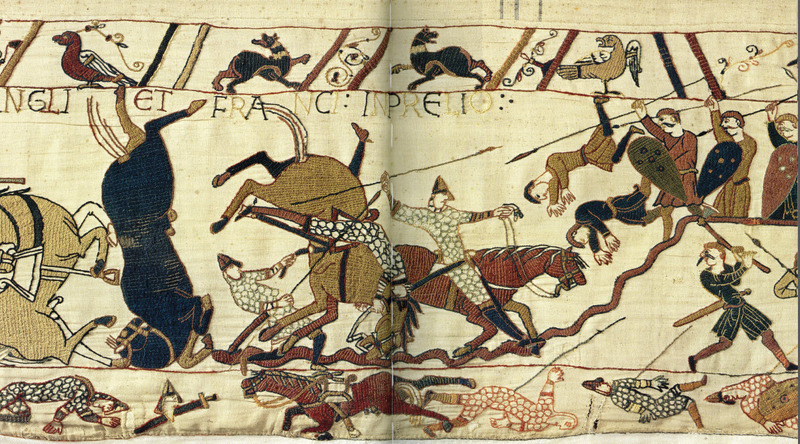 The Bayeux Tapestry and the Battle of Hastings 1066. Copenhagen: Christin Ejlers Publishers, 2002. Print. Wilson, David M. The Bayeux Tapestry. New York: Thames & Hudson Inc., 1985. Horses tumble in a battle between the English and the French (Wilson, pl. 66).